Do I need a new computer? The eleventh is upon us, and with that the arrival of The Elder Scrolls V: Skyrim. This game has been at the top of our list for some time now and the anticipation is intense. Nominated for game of the year by Spike, this game is a must have for fans of RPG games everywhere. For those who are familiar with the Elder Scrolls series, there are many new additions to Skyrim. If you haven’t played any of the previous games in the series, don’t fret. Each game has been largely independent of the previous ones. The Elder Scrolls games have been the epitome of open world gameplay for years. In this open world epic, the idea of freedom (go where you want and do what you want at any time) is a huge part of the series. With excellent storytelling and a massive amount of content to push through hundreds of hours of gameplay, it is easy to see how one could easily get lost in the world of Tamriel. The environments, characters and quest are extremely immersive. 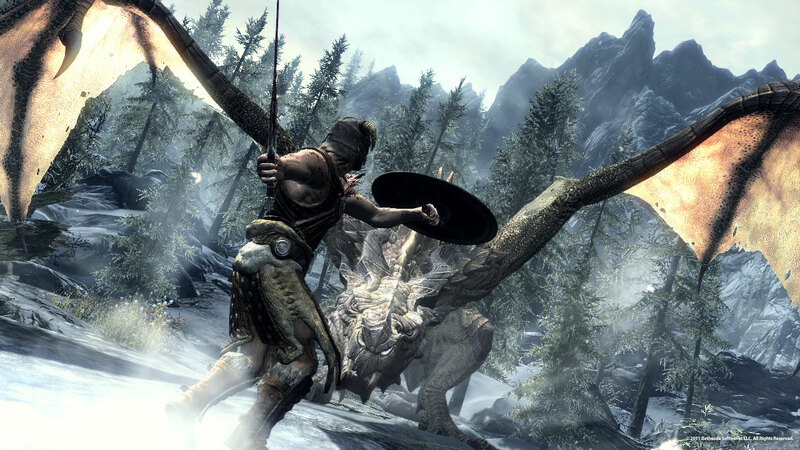 -Skyrim is built on a whole new engine, so visuals will be state of the art. -Dragons have returned, and you get to conquer them and learn their secrets. different combinations allows you to customize your character more than ever. -Finishing moves have been added, so you can dispatch enemies more effectively. -You can interact with the economy in Skyrim, learning tradeskills such as blacksmithing. So far, the question we have been hearing isn’t “Should I get Skyrim?”, it’s “Should I get Skyrim on the console or PC?”. The differences between actual content (at release anyway) is nonexistent. The only differences between console and PC are the possible performance differences, and the interface for control. 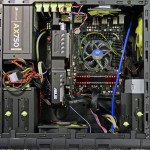 The PC has the potential to display in higher resolutions and more detailed textures, so long as your computer is powerful enough to do so. There is also the potential of faster loading times, once again barring your system specs. The last advantage worth noting about the PC version is pat later release of mods for the game. After some time, mods created by third parties to expand the game can become available but only on the PC. It takes a little know how to patch these into the game, but once these become available we will offer tutorials. Since we mentioned POSSIBLE performance improvement on PC, we wanted to take a look at the recommended specs Bethesda announced. The minimum requirements for Skyrim are listed as well, but we do not suggest running the game on the minimum reuirements. If your system doesn’t meet these requirements we suggest picking the game up on the console. Without a good system you will not get the most out of the PC version and would probably benefit more by the performance of your PS3 or Xbox360. -Can your computer handle the game well enough to enjoy the game? -Do you prefer your keyboard, mouse and monitor, or your controller, couch and TV? This of course assuming you will not be making any other purchases aside from the game.